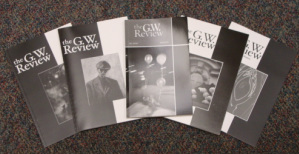 Founded in 1980, The GW Review is The George Washington University's biannual literary review. We publish fiction, poetry and two-dimensional art from American and international artists. We also give GW students the opportunity to be published in our annual Senior Contest. Please browse our new website for more information on submissions, campus events, and joining our editorial board! for the neglectful mistake that led to the absence of her name and biography from the back cover and contributors section, respectively. Below we include her biography, along with our sincerest apologies. Gira Patel is a high school senior that plans on pursuing a career in graphic design. She prefers capturing simple things that give a sentimental feel when being viewed. When she’s not spending her free time editing photography and videos, Gira enjoys exploring abandoned buildings to find inspiration. She has participated in the Elijah Cummings Congressional Art Competition for two years in a row and also received the Eubie Blake National Jazz Institute Award for her digital work. Now, Gira is in the National Art Honor Society continuing to achieve her goals as an artist.